Have you heard the latest buzz from our DigiLab Hackathon winners? The innovative LiveHive project was crowned winner of the Sopra Steria UK “Hack the Thing” competition which took place last month. Sopra Steria DigiLab hosts quarterly Hackathons with a specific challenge, the most recent named – Hack the Thing. Whilst the aim of the hack was sensor and IoT focused, the solution had to address a known sustainability issue. The LiveHive team chose to focus their efforts on monitoring and improving honey bee health, husbandry and supporting new beekeepers. Bees play an important role in sustainability within agriculture. Their pollinating services are worth around £600 million a year in the UK in boosting yields and the quality of seeds and fruits. The UK had approximately 100,000 beekeepers in 1943 however this number had dropped to 44,000 by 2010. 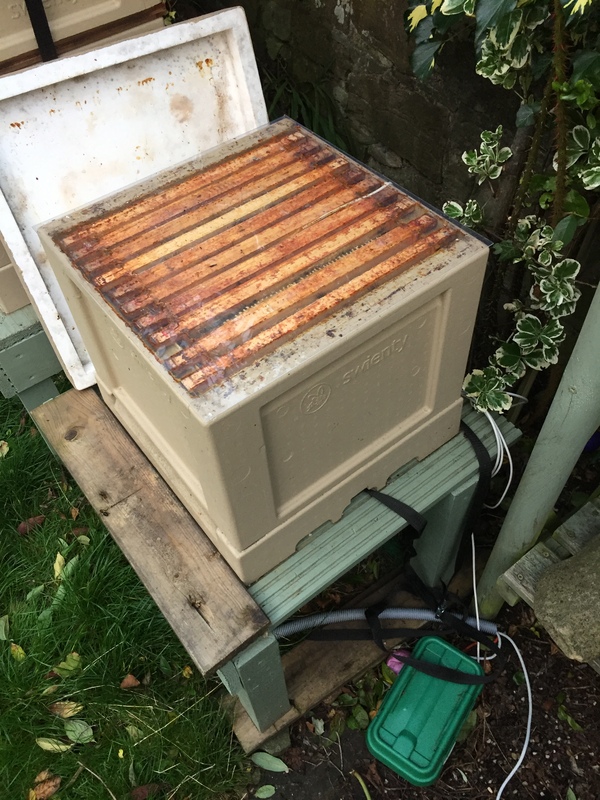 Fortunately, in recent years there has been a resurgence of interest in beekeeping which has highlighted a need for a product that allows beekeepers to explore and extend their knowledge and capabilities through the use of modern, accessible technology. LiveHive allows beekeepers to view important information about the state of their hives and receive alerts all on their smartphone or mobile device. The social and sharing side of the LiveHive is designed to engage and support new beekeepers and give them a platform for more meaningful help from their mentors. The product also allows data to be recorded and analysed aiding national/international research and furthering education on the subject. The LiveHive Solution integrates three services – hive monitoring, hive inspection and a beekeeping forum offering access to integrated data and enabling the exchange of data. 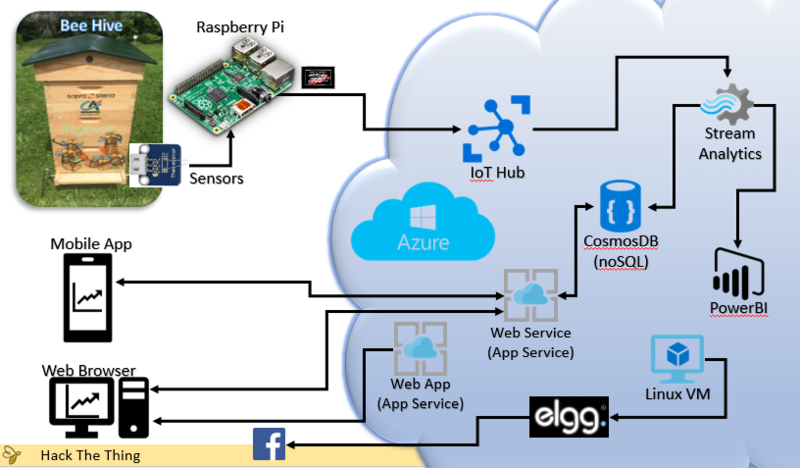 Technology Sensors: to monitor conditions such as temperature and humidity in a bee hive, transmitting the data to Azure cloud for reporting. Human Sensors: a Smartphone app that enables the beekeeper to record inspections and receive alerts. Sharing Platform: to allow the novice beekeeper to share information with their mentors and connect to a forum where beekeepers exchange knowledge, ideas and experience. They can also share the specific colony history to help members to understand the context of any question. 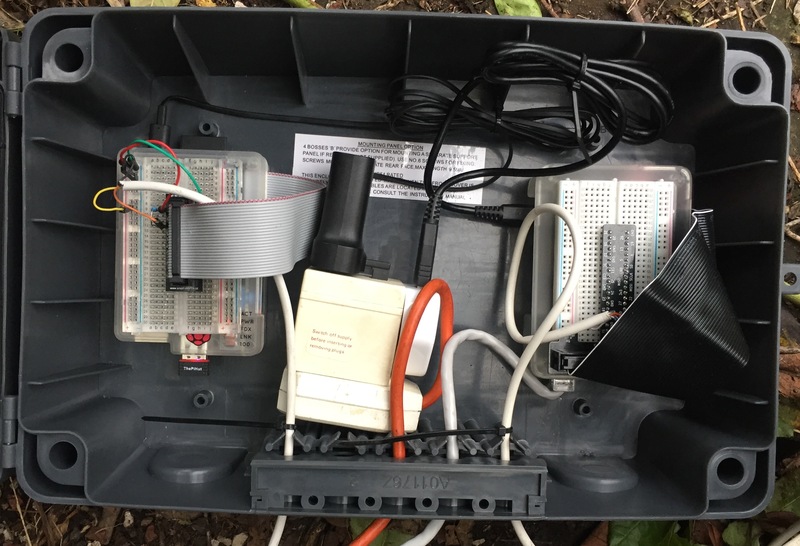 A Raspberry Pi measures temperature, humidity and light levels in the hive transmits measurements to Microsoft Azure cloud through its IoT Hub. On a larger scale, the data behind the hive sensor information and beekeepers inspection records creates a large, unique source of primary beekeeping data. This aids research and education into the effects of beekeeping practice on yields and bee health presenting opportunities to collaborate with research facilities and institutions. The LiveHive roadmap plans to also put beekeepers in touch with the local community through the website allowing members of the public to report swarms, offer apiary sites and even find out who may be offering local honey! 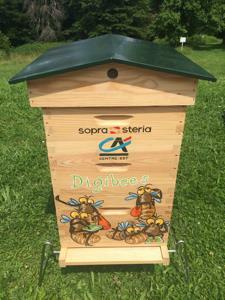 The team have already created a buzz with fellow bee projects and beekeepers within Sopra Steria by forming the Sopra Steria International Beekeepers Association which will be the beta test group for LiveHive. Further opportunities will also be explored with the service design principle being applied to other species which could aid in Government inspection. The team are also looking at methods to collaborate with Government directorates in Scotland. It’s just the start for this lot of busy bees but a great example of some of the innovation created in Sopra Steria’s DigiLab! Mirror, 2016. Why are bee numbers dropping so dramatically in the UK? Posted on 1 December 2017 8 December 2017 Author Stephen ReadmanCategories Agile, Cloud, Customer experience, Data, Design, Innovation, SustainabilityTags Animal Inspections, Azure, beekeeping, bees, Cloud, DigiLab, Government Inspections, Hackathon, HackThe, HackTheThing, Innovation, IoT, Maker, Raspberry Pi, SustainabilityLeave a comment on Have you heard the latest buzz from our DigiLab Hackathon winners?